CNN debunks myth that GOP tax plans help the middle class, outlining "tax gifts for the wealthy"
President Donald Trump took to Twitter on June 11 to echo misleading claims from Fox News that job growth in his first four full months in office was proof of his economic success. Both Fox and the president failed to notice, however, that it was the weakest February through May stretch of job growth since the end of the Great Recession. ...way up. Regulations way down. 600,000+ new jobs added. Unemployment down to 4.3%. Business and economic enthusiasm way up- record levels! According to the Bureau of Labor Statistics (BLS), the economy in fact created 594,000 jobs from February through May of this year. Projections for April and May are preliminary and subject to change, but by comparison to previously established trends for the same timeframe, Trump has little to boast about. More jobs were created during the same four-month window in each of the past seven years under President Barack Obama. These simple facts did not stop the pro-Trump sycophants at Fox News from continuing to push their favorable talking points. 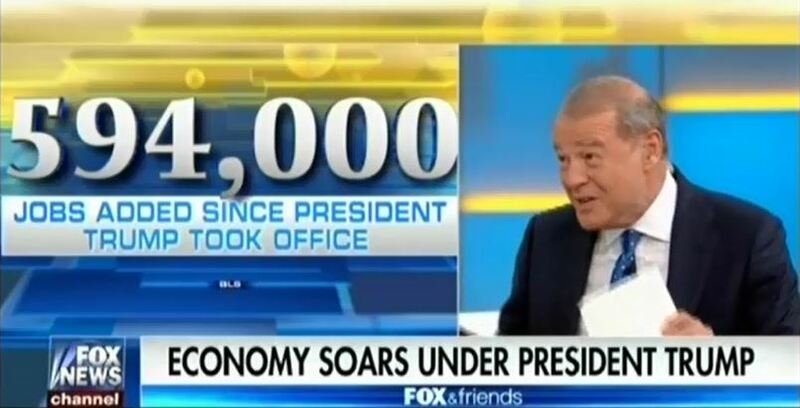 On the June 12 edition of Fox News’ Fox & Friends, guest Stuart Varney laid out the same argument that Trump had tweeted and added that “it’s a disgrace” that news outlets had been focused on Trump’s scandals instead of giving the president credit for a strong economy. Later on Fox News’ America’s Newsroom, guest Melissa Francis again pushed the 594,000 jobs created between February through May as proof of a strong economy under Trump. Since Trump was elected, Fox has pivoted from mischaracterizing reports on the economy to blast Obama to mischaracterizing reports on the economy to hype or defend the Trump administration. Fox personalities frequently heap praise on economic indicators weaker than those they had once excoriated. The network has also reversed completely on how it reports jobs data, giving Trump credit for jobs he didn’t even create, and reporting glowingly on job creation under Trump that had become routine under Obama. The White House first hinted at slashing programs that help working- and middle-class Americans on February 26 when, according to Bloomberg, Trump floated proposals to increase defense spending by 10 percent while cutting programs including assistance for low-income Americans while still promising not to touch Medicare, Medicaid, and Social Security. The White House claimed these drastic cuts would help spur economic growth, an absurd claim that was resoundingly ridiculed by economists as “deep voodoo” and “wholly unrealistic.” The administration’s initial budgetary proposals were so drastic and poorly thought out that they stunned many observers and experts. The White House even advocated cutting assistance to the Corporation for Public Broadcasting, which would be particularly harmful to “small-town America,” and Meals on Wheels, which “doesn’t make economic sense” and would cruelly deny millions of elderly Americans basic companionship and a hot meal. As details of Trump’s budget plan continued to leak, some media outlets explained the devastating consequences for millions of Americans if the White House gets its way and these drastic cuts take effect. They also explained that Trump’s embrace of deep cuts to components of Medicaid and Social Security represent a betrayal of his promises from the campaign. Will Journalists Continue To Take Trump’s Empty Economic Promises Seriously? According to a new survey from the University of Chicago, vanishingly few economists agree with the claim of President Donald Trump’s administration that blowing up the deficit with tax cuts for the rich will pay for itself by generating new economic growth. Professional economists have warned of Trump’s economic agenda for over a year; when will news outlets stop taking his boasts seriously? This timely rebuke by economists of Trump’s economic smoke and mirrors seemed to have been lost on CNN, which spent much of May 5 promoting the inexplicable claim that unnamed "economists" think Trump's rhetoric alone had so far been enough to stoke economic growth. CNN host Jake Tapper falsely claimed “many economists credit” Trump’s promise of tax cuts, deregulation, and profligate spending for job creation since he took office. CNN chief business correspondent Christine Romans bizarrely claimed throughout the day that Trump’s “rhetoric” about the economy was responsible for a minuscule uptick in manufacturing sector employment, which rebounded substantially under former President Barack Obama. The survey results showing that economists don’t trust Trump’s tax cutting agenda add to a growing body of evidence demonstrating that cutting taxes for the rich is a bad way to boost the economy. Nobel Prize-winning economist and New York Times columnist Paul Krugman called Trump’s trickle-down economic plan a return to the “voodoo economics” of the Bush and Reagan administrations and pointed to numerous examples of previous Republican administrations cutting taxes and not spurring growth. Independent research from the Congressional Research Service and Brookings Institution has been unable to find a causal relationship between tax cuts and economic growth, and many experts who hammered Trump’s fiscal policy proposals have pointed out that his restrictive approach to trade and immigration is likely to dampen economic activity, not enhance it. Trump has been pilloried for having only a few credentialed economists on his economic policy team and 370 economists, including eight Nobel laureates, signed a letter denouncing his repeated lies and “conspiracy theories” about the state of the American economy. It is no wonder that Trump could not manage to garner the support of a single former member of the White House Council of Economic Advisers during his presidential campaign. What remains to be seen is why any media outlet, such as CNN last week, would take his positions seriously or accept his policy proposals at face value. CNN hyped meager growth in manufacturing employment shown in the latest monthly jobs report from the Bureau of Labor Statistics (BLS) as an example of robust Trump-driven job creation -- a claim so absurd it would make Fox News blush. In total, the jobs report for the last month wasn’t very different from other reports of the recent past, which had become routinely positive since the economy began recovering from the Great Recession. And Romans’ adoring portrayal seemed more suitable for the professional sycophants at Fox News than the reporting team at CNN. Equal Pay Day, which fell on April 4, “symbolizes how far into the year women must work to earn what men earned in the previous year,” according to the National Committee on Pay Equity. Right-wing media outlets, which have long denied the very existence of a gender pay gap, used the annual commemoration as an excuse to attack progressives as hypocrites on the need for pay equity, airing recycled and debunked talking points previously used against President Barack Obama and former presidential nominee Hillary Clinton. Warren is far from the only politician who pays women less than men. Most notable on the list is failed Democratic presidential candidate Hillary Clinton, who paid women less than men first as a senator, then as secretary of state, and as a presidential candidate. Her campaign viewed her tendency to pay women less than men as a campaign vulnerability. Former President Barack Obama regularly spoke out about the gender pay gap, but women working at the White House were paid less than men. Despite continued efforts to make pay in the United States more equitable, the gender pay gap persists. According to the Center for American Progress, women still earn only 79 cents for every dollar a man makes and the pay gap is even wider for women of color. April 4 marked the day when working women finally caught up to the earnings men accrued in 2016, but all Fox and the right-wing chorus wanted to do to commemorate the occasion was push tired and recycled myths. Discredited right-wing economic pundit Stephen Moore used his first appearance on CNN since joining the network as its “senior economics analyst” to put a negative spin on the Obama-era economic recovery while squirming out of questions about lies that President Donald Trump, whom he advised during the campaign, turned into routine campaign talking points. CNN was as culpable as any other network in promoting Trump’s rise, but its economic team usually stood up to the Republican candidate’s falsehoods. Last year, global economic analyst Rana Foroohar left a mark on the campaign by blasting Trump’s trade policy agenda as “either a bad idea or impossible,” and ridiculing his proposal to pay off the national debt as “absolute fabulism.” Over the summer, correspondent Cristina Alesci and then-analyst Ali Velshi torched Trump’s economic fairness agenda, agreeing it seemed to be “designed for higher-income, more affluent families” rather than, as Trump had promised, middle-income Americans. On the jobs front, just this morning chief business correspondent Christine Romans -- who makes her living calling out Trump’s lies about the economy -- mocked Trump for accepting the jobs data, saying, “There’s no conspiracy in the numbers when they belong to him.” In fact, less than an hour before Moore took Blitzer to the spin room, CNN viewers were treated to White House correspondent Jim Acosta calling out the Trump administration for “embracing” data that it “repeatedly raised doubts about” during the campaign. Contributor Nia-Malika Henderson added that Trump should “send President Obama some flowers” to thank him for leaving behind such a healthy economy. Moore doesn't do anything to bolster CNN’s economic reporting; in fact, his “troubled relationship with the facts” diminishes the network. All he brings to CNN is his deft capacity to recycle right-wing media talking points that portray Obama in the harshest possible light. President-elect Donald Trump spread numerous falsehoods, myths, and outright lies about the state of the American economy in 2016. As the year comes to a close, Media Matters offers eight examples of journalists and media outlets debunking Trump’s outrageously misleading statements.